After several days of paddling for fun -- something that goes by the term "personal paddling" in our kayak logs -- we were scheduled to teach a Level 2 class yesterday at Geneva Kayak Center. The class began at 9 a.m. at the Big Rock Quarry in Sugar Grove, but we had to leave our house pretty early to drive to Geneva; hitch up the trailer; load the spray skirts, life jackets*, paddles, pumps and paddle floats; stop for more coffee; and get to the quarry before the students arrived. Time to get on the road. That's a.m., not p.m.
On the drive out, we reviewed our lesson plan, making a few modifications based on new ideas we'd been thinking and talking about. We wrote an outline on an index card and put it in a zip-lock baggie because we were too sleepy to keep more than one idea in our heads at a time, and right then, that idea was the need to drink more coffee. Boats and gear are loaded up, and we're ready to head for the quarry. Shortly after we arrived at the quarry, our students began showing up. They were excited, and their mood was infectious. Before long, the five-hour night was forgotten and time began to fly. This is what makes it all worthwhile. Six hours evaporated. We aren't even sure where they went. We worked on wet exits, strokes and rescues. We talked about safety and local paddling opportunities. And in the process, a group of strangers began to feel like a group of friends, and a group of beginners gained considerable skills. At the end, it was hard to say "good-bye," and many of them lingered, helping us strap down the boats and chatting. Teaching is rewarding on many levels. Students force you to think about why and how you do the things that you do without thinking. They require you to figure out how they learn so you can effectively teach them. They remind you how far you've come as a paddler. And they reinforce your conviction that kayaking is a blast. piece of equipment all paddlers should have and should wear. the types of lifejackets and/or regulation issues. and PFD for regulatory reference." Yesterday, Hannah, Alec & Sharon took Clare (8) and her mom, Karin, to 63rd Street Beach. Somewhere on the road between Grand Marais and Chicago. Who knew? 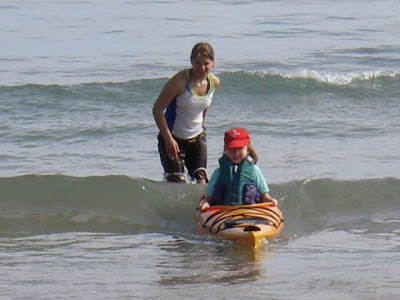 Between Memorial Day and Labor Day, the midwest supports eight kayak symposia, from the old (Great Lakes Sea Kayak Symposium) to the new (Windy City Symposium), from the family-oriented (West Michigan Coastal Kayakers Association) to the all-female (Ladies of the Lake). Some are traditional (Greenland Symposium and QUJAQ Training Camp). Most are “bicultural” (Door County Sea Kayak Symposium, Inland Sea Symposium). 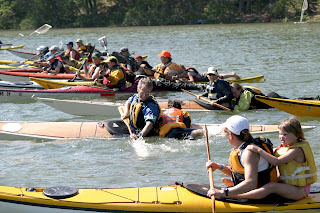 But all have some key attractions in common: They offer an opportunity for students to take a wide range of classes from numerous instructors in a concentrated period of time; they enable vendors to demonstrate and explain their gear to potential buyers, and potential buyers to test paddle a variety of kayaks; they provide beginner and intermediate paddlers with access to top-notch coaches from around the country and the world; they feature presentations by world-class kayakers who've completed expeditions the rest of us can only dream about; and they enable a gypsy group of local kayak instructors to reconnect several times during the summer months. The rodeo at the Western Michigan Coastal Kayakers Symposium, where students and instructors apply their paddling skills to absurd challenges. Many symposia include trips. 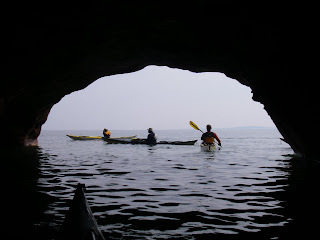 Here, students and instructors paddle through the Apostle Island sea caves during the Inland Sea Kayak Symposium. Doug Van Doren checks out a waterfall along Pictured Rocks National Lakeshore during the Great Lakes Sea Kayak Symposium. Most of us who teach at these symposia do so as volunteers. We provide all our own gear, pay for our own transportation, and donate our time. Students are sometimes baffled by this generosity. In fact, it's really not so hard to understand what motivates us: a desire to offer newer kayakers what was once offered to us, a dedication to sharing our enthusiasm and knowledge about a sport we love, and the pleasure of hanging out with other people who feel the same way. In the five short years that we've been paddling, we've grown very fond of our fellow midwestern instructors. We are a family of sorts, full of larger-than-life characters, crazy stories, mischief and compassion. We strip in parking lots, debate the stink-resistance of various types of clothing, eat one another's food and watch out for one another. If that's not family, what is? Students pick up on this camaraderie. We still recall our first symposium, where we were impressed by how much fun our instructors were having and how much they enjoyed one another's company. Thanks in part to them, we became skilled enough to offer the same inspiration and instruction to the next cohort of paddlers. Symposia aren't a substitute for taking full classes at a reputable kayak center. They're more like a tasting menu, while full-length classes are a multi-course meal. But symposia are where community is built and sustained, and the midwest is fortunate to have so many. Sharon with Lyn on a Chicago beach. Every community has its unsung heroes—people who make a difference without fanfare. The kayaking world is full of such people. Often they're instructors who patiently teach a wide range of students, making them better and safer paddlers. In the coming months, we plan to profile some of these people, with a focus on ones in the midwest. Lyn helps a novice paddler get settled in his boat at the Great Lakes Sea Kayak Symposium. Lyn Stone is our first victim in this endeavor. Sharon first met Lyn in 2006 at Ladies of the Lake, a kayaking symposium in Michigan's Upper Peninsula. (It moves around. This year, it will be held on Drummond Island from August 21 to 24. Get the details at Down Wind Sports.) The meeting was classic Lyn (and Sharon, for that matter). Sharon showed up for a BCU three-star training without her spray skirt, which was hanging back in the campsite several miles from the put-in. Lyn, true to form, had a spare and offered it to Sharon. We later learned that Lyn has a spare or a repair for practically every essential piece of gear. She's has a remarkable depth of knowledge about kayaking, but she shares it selectively, not boastfully, when it's requested or needed. And she's bicultural, in the paddling sense of that term; she prefers a Greenland stick but teaches mainly with a Euro paddle. Alec first met Lyn at a Geneva Kayak Center staff training the following year, where he was impressed by her down-to-Earth attitude. But best of all, she's always willing to help out, whether a friend needs new deck rigging or a student needs coaching. Lyn is part of our instructor cohort. She and Sharon were certified together by Sam Crowley in September, and the three of us have trained and taught together since then. We rely on one another as we refine our ideas, reflect on our experiences, and grow as paddlers and instructors. After we returned from Michigan's east coast, we spent one day paddling our home waters with Lyn. We put in at the 59th Street harbor and paddled past the fishermen and docked motorboats and out onto the lake. We retrieved balls and balloons that children had lost while playing at the 63rd street beach, and took at detour into the 57th Street harbor to visit Maynard Welch, the retired harbormaster who continues to best represent the spirit of that lovely harbor. (For a profile of Maynard, check out the Nov. 22, 2005 issue of the Chicago Tribune.) Then we paddled down past The Point, where we held our engagement party 20 years ago. The water was a little bumpy, with wind waves refracting back off the rocks, and boat traffic was light. We stopped on a lovely little pebble beach to eat lunch and watched two dogs repeatedly compete to retrieve a buoyant rubber bone from the water. Dry suits are our best effort to replicate what these swimmers were born with: fur. 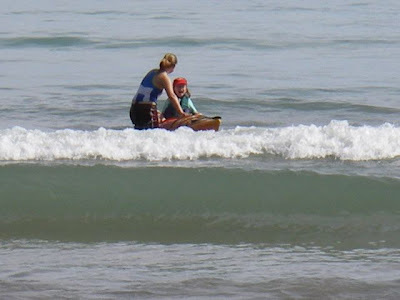 Paddling partners have numerous roles. We watch out for one another's safety, encourage one another to continue improving, and support one another when our bodies or our confidence isn't up for the challenges that confront us. Yes, we're local heroes, if only to one another. Then we hang up the neoprene and, like Clark Kent, go back to our day jobs. The scene outside Sherman's Dairy Bar on a warm Friday afternoon. Add this to the list of places you must stop on your way home from Michigan. Sherman Dairy Bar, an unprepossessing creamery and ice cream parlor on Phoenix Road in South Haven, has been serving up huge scoops for 50 years. On a hot weekend afternoon, you might have to stand in line for 10 or so minutes, but it's well worth the wait. You can choose between about 50 flavors, from chocolate and vanilla to cappuccino and coconut almond fudge, all made with real ingredients and no artificial flavorings. It's anything but low-fat, and it's utterly fabulous. Until this year, we've spent most of our extracurricular (non-teaching) paddling time working on our skills and enjoying the camaraderie of Chicago-area paddlers. But thanks to the symposia we've been attending, we've also made connections across the country, and we've begun seeking out our paddling partners when we travel. On this trip, we were able to hook up with Frits Kwant (see Tuesday's post) as well as two other WMCKA paddlers we've long wished to spend more time with: Keith Wikle and Paul Fishback. Our plan was to meet at 5 p.m. near the channel that connects White Lake to "the big lake" (Lake Michigan). 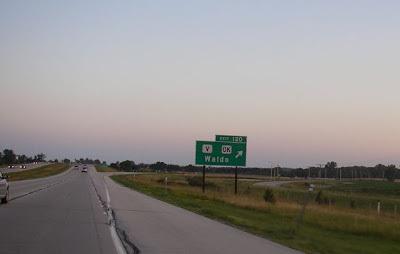 But a conspiracy of weather and traffic kept us about 5 miles north in Frits' house and off the water until about 6:30 p.m. The NOAA weather radar revealed a major storm cell over Green Bay, Wisconsin, which we estimated would allow us time for at least a short paddle. We agreed that we would not paddle all the way down the coast to White Lake, and that it would be easy to pull off if the weather worsened and wait it out. So much for plans. As soon as we got on the water, Keith set a brisk pace and before we knew it, we were more than half way to our destination. The storm didn't look too close, and since we were within easy reach of White Lake, we decided to continue. Besides, we were getting hungry. Frits and Paul paddle into the wind. Our flexible float plan hinged on the speed with which a storm moved in from Green Bay. Keith tries to hide his carbon fiber snow shovel. Where's your Greenland stick, Keith? We reached the take-out a little after 8 and finished the car shuttle. By the time we were nearly done loading our boats, it was raining and thundering, with lightning illuminating the sky. We devoured our dinner and were among the last to leave the inn that night, setting out like so many wanderers to our separate destinations for the night. Photo op out on the lake. We didn't quite get to the Old Channel Inn by 9 p.m. for dinner, but when we arrived, Clarice was waiting and the storm was only too happy to let loose. Thanks for paddling with us Frits, Paul and Keith! We look forward to paddling with you and our other wonderful WMCKA friends in the coming months and years. Approaching the lighthouse from the side it was designed to be seen from. Yes, we're fine. In fact, we like the waves. Would you please dispose of the garbage we collected from the water? We returned just in time to catch headwinds all the way back, too. Here's what we collected on the way back. We went fishing for trash and came back with quite a haul! Most of it is chip bags and candy wrappers. If fewer foods were sold in single-serving packages and people ate more whole foods and fewer convenience foods, perhaps there would be considerably less garbage in the water. Sharon, Frits and Alec on the Lake Michigan beach where Frits keeps his boats and paddles almost daily, weather permitting. We met Frits Kwant almost by accident at the West Michigan Coastal Kayakers Association symposium this year. We were, as usual, among the last to finish packing up and leave, and Frits was in no hurry because he lives only minutes away. When we mentioned that we would be visiting the area in early July, he graciously offered to reserve a campsite for us. So of course we had to paddle together. Frits has been paddling for 17 years. During that time, he has built four boats, numerous Greenland-style paddles, and a charming collection of maritime-themed plywood sculptures. Ten years ago, he retired from his job as a special education teacher in the Grand Rapids school system; a couple years ago, he and his wife, Clarice, remodeled their summer place near the lake into a year-round home, sold their house near the city, and became some of the few full-time residents of this glorious area. Frits does not suffer from nature-deficit disorder. If he isn't on the lake, he's running along the country roads or watching the humming birds that frequent the many feeders that line his porch. A spry 67-year-old with a twinkle in his eye, he's open to adventure and has paddled some pretty challenging waters. He isn't interested in certifications and other external validations of his commitment to kayaking. He's simply a man who loves to paddle and has acquired the skills he needs to enjoy the sport safely. We set off from the beach near Frits and Clarice's home and paddled north through choppy wind waves to Flower Creek, an almost hidden waterway that snakes past a few summer homes and then through marshland inhabited by muskrats, deer, turtles and innumerable birds. A few of the residents of Flower Creek. Moments later, they slipped into the water. The unusually high water levels allowed us to paddle for what seemed like miles, though it was difficult to say how far we actually went through the twist and turns. It was peaceful and quiet, in contrast to the crashing waves on Lake Michigan. Frits appreciates both equally: the gentle creek and the challenging waves, the intimate view of one little area and the expansiveness of the big lake. And all the while, he shared with us stories of this place and the people who live here. Kayakers always rely on local knowledge. It's how we learn when and where to paddle. It's how we avoid hazards and find out about the best a place has to offer, from surf waves to pie. Frits was our premier source of local knowledge this week. He shared his knowledge (and his time) freely, and we feel grateful. A lone tent amid RVs. It's very quiet, if not exactly rustic. We're staying at Meinert County Park, near Montague, Michigan. We are the lone tent in a campground full of RVs, many of them parked here for the season. How camping has changed since we were kids! Back then, you spent a few dollars for a small spot without water, electricity or too many neighbors. These days, it's not unusual to pay $25 and get all those hook-ups whether you want them or not. Back then, there were lots of tents and few of these enormous homes-on-wheels. These days, RVs are the norm, and many feature outside decorations and well as all the indoor amenities of home (showers, air conditioning, televisions). We think we understand the proliferation of RVs as car culture meets convenience. They're cheaper than owning a cottage or staying in motels while traveling. They're not really a substitute for tents as much as they are an opportunity to have your home and leave it, too. This is the quietest campground we've encountered because everybody seems to be indoors watching TV. We have the bathroom to ourselves because everybody else brought their own. It's not all bad! Neatly docked in their slips. What would you name them? "Lovely lady?" "He's not home?" This campground reminds us of a harbor in which we are the only kayaks and everyone else has docked their motorboats. But unlike boat owners, RV owners don't seem to name their mobile homes. Imagine if they did. What would they choose? Perhaps they'd go for the corny names boat owners choose, such as "Betsy Sue" and "Dividends." Or maybe they'd go the bumper sticker route with "My other home is a castle." Off with the old; on with the new. Most of what you need to replace your dry suit's neck gasket. The first couple of days after we return home are taken up by laundry, bills, weeding, returning calls and emails, and other mundane activities that expand like kudzu in our absence. There's no time for the conventional r-and-r (rest and relaxation). But we have an r-and-r of our own: repair and reconnect. Sharon's dry suit neck gasket gave out a month ago. We think it was a casualty of heavy use and sunscreen. (Even if you're careful to apply sunscreen after your dry suit is on, you'll get some on your gasket every time you get in our out of the suit.) So we cut if off (scary!) and followed Kokatat's excellent directions for replacing it with a new one. What's a dry suit and why do you wear one? It's a waterproof garment with latex gaskets at the neck and wrists (and sometimes the ankles, unless it includes booties) worn when water temperatures are low enough that a paddler might risk hypothermia (at worst) or discomfort and unwillingness to take risks (at best). Ours are made of breathable GoreTex, so they're surprising comfortable in warmer air conditions. We bought them when we realized that they could extend our paddling season. They're by far the most expensive pieces of clothing we own and the most indispensable. The other "r" stands for reconnecting. We've caught up with our families and many of our friends. It must be time to go paddling again! Sharon helps Watermelon Man try on her dry suit. Kayaking is a so-called "silent sport." It shares this status with bicycling, sailing, running and other pursuits that don't require a motor. As such, it's kind to the environment as well as healthy for the body. All good so far. So the irony is this: All year long, we minimize our car usage. The kids walk or ride their bikes (or, in Jeremy's case, unicycle) to school. I take the train to work. We even pull a bike trailer to the store to buy groceries whenever the weather and our schedules permit. Until the summer, we are far below the 10,000-mile average most car drivers put on each year. Then paddling season arrives and we negate all our virtuous car avoidance. At least we aren't polluting the water after we park.